Should There Be Rules Restricting Bamboo Planting? Yellow groove bamboo is what's most commonly planted in Indiana, but it's considered invasive (Barbara Brosher, WFIU/WTIU News). An increasing number of cities and states are adopting regulations for the sale and planting of bamboo. Certain types are actually considered invasive, and can quickly spread to multiple properties. But, there’s nothing to stop Hoosiers from planting bamboo. 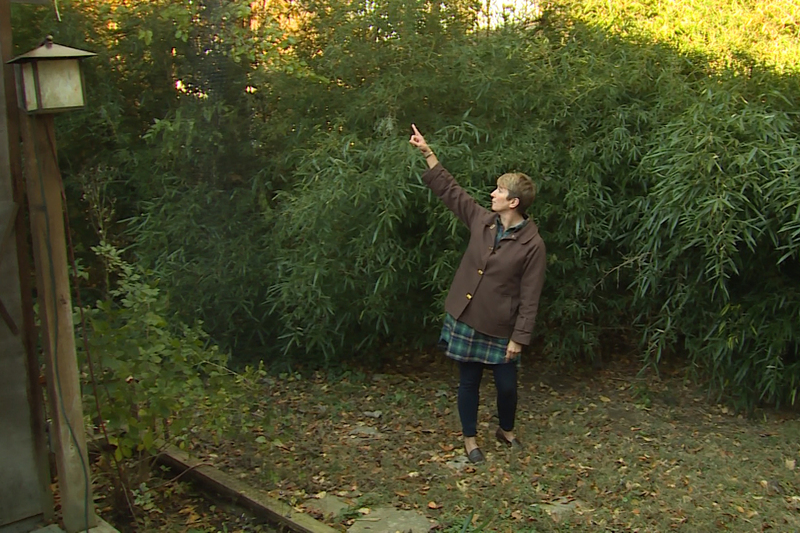 Brandi Hosts points to the bamboo that towers over her in her backyard. She works hard to contain the plant to her property (Steve Burns, WFIU/WTIU News). Brandi Host lives in the middle of Bloomington. But, you'd never know once you step into her backyard. It's lined with a dense patch of bamboo. Many of the stalks are more than twice her height, and provide a natural fence around the property. Host appreciates the privacy the plant provides. "I think it’s a really good sound barrier too," Host says. "I don’t hear anyone back here." But when she bought the house a few years ago, she had no idea the maintenance the bamboo would require. "The previous owner’s wife at the closing asked me if I owned a truck, and I said I didn’t," Host says. "And, she just giggled. Because she knew." Host has to clear a large portion of the bamboo once a year, and it takes two truckloads to haul it away. She takes it to a friend's property, where it's burned as part of a bonfire. "Stopping it is next to impossible without major excavation work," she says. "And, so what I’m trying to do is just maintain and control it more than anything." And, that's no easy task. Just ask Dave Seastrom. "As soon as I got it in the ground, I started realizing what a tremendously invasive plant it is," he says. Seastrom planted a patch of bamboo on his secluded Unionville property about 20 years ago. He likes that the shoots provide shelter for wildlife, and also dries them out to use for various projects. But, keeping the bamboo patch from overtaking the yard is labor intensive. He dug a trench around the patch, and inserted a plastic barrier in the ground to try to keep it from spreading. "As long as I’m here I think this is contained," he says. "But, I’m very concerned about the reality that one day I won’t be here. And, it would be extremely harmful if this bamboo got loose in the forest." 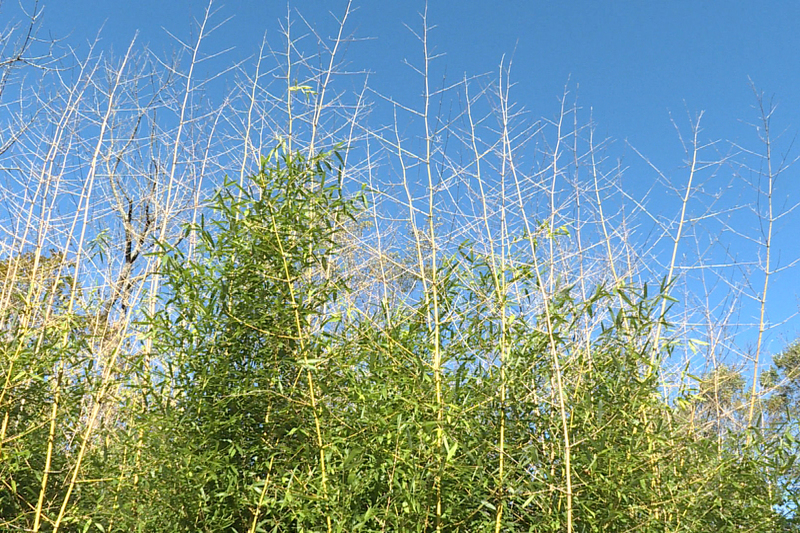 Bamboo spreads quickly, and can grow to be as tall as trees (Barbara Brosher, WFIU/WTIU News). 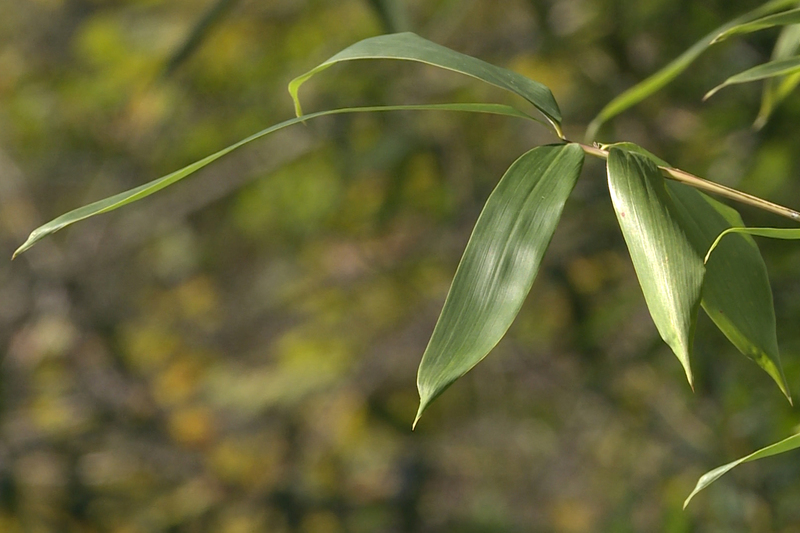 The type of bamboo that's most often planted in Indiana is called yellow groove bamboo. It's what's called a running bamboo, making it difficult to control. "It sends out underground rhizomes that put up new shoots," says Ellen Jacquart, chair of Monroe County Identify And Reduce Invasive Species. "And, it does that vigorously through the entire growing season. So when you’re planting something like yellow grove bamboo, that’s one of the running bamboos, you’re not planting it in your yard. You’re planting it in the county." 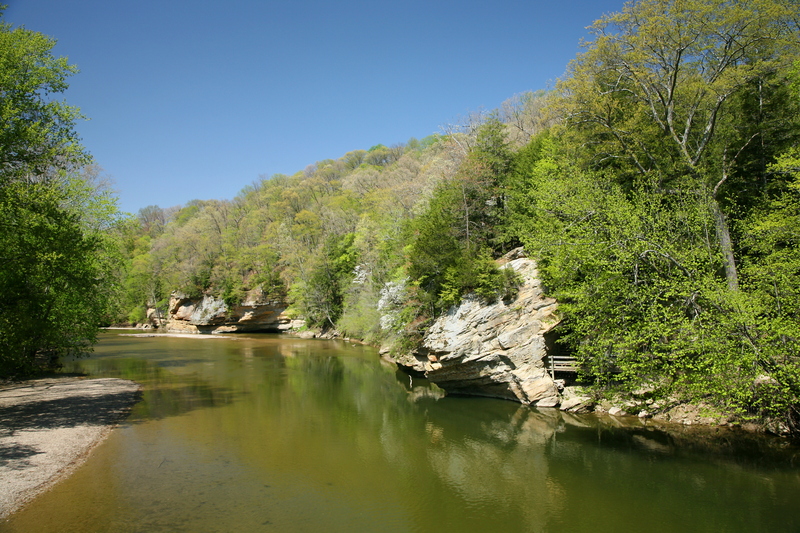 That led Connecticut to pass a law in 2013 that regulates where people can plant bamboo, and makes them liable for any damages it causes to neighboring properites. Some cities in other states have also passed their own bamboo restrictions. But, no such law exists in Indiana. The state’s Natural Resources Commission did preliminarily adopt a measure earlier this year that would make it illegal to sell, transport or distribute a list of more than 40 invasive plants in the state. "And, while bamboo isn’t on it, I think that in the future we’re going to be looking at evaluating it and seeing if we can add that to the highly invasive list for Indiana," Jacquart says. In the meantime, she has a few tips for those who are trying to keep bamboo from overtaking their properties. She says mowing the bamboo repeatedly will keep it from advancing, but it won't kill the plant. "What many people do is mow it or cut each stem off and then drip herbicide into the cut stem," she says. "And, by doing that, the plant will take the herbicide down into the roots and kill the plant." That process can be labor intensive. 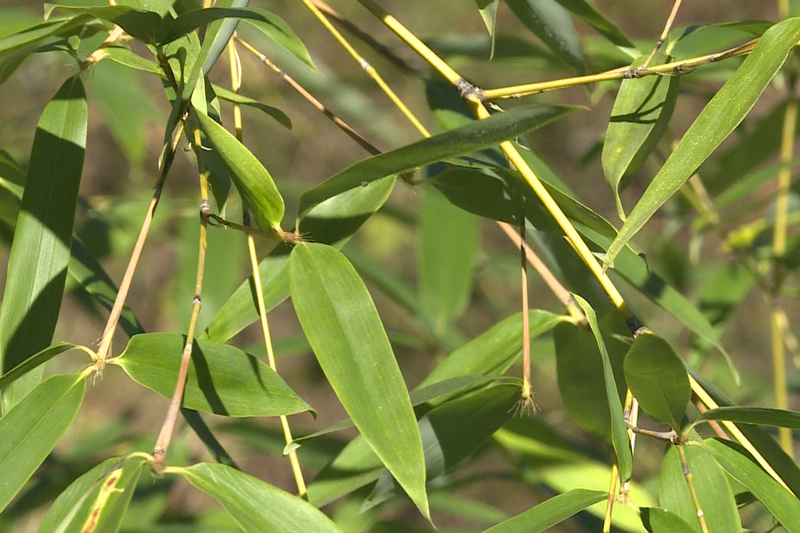 It can be difficult to try to contain or kill bamboo (Barbara Brosher, WFIU/WTIU News). As Host looks around at the bamboo she struggles to contain, she stops short of saying planting it should be regulated. "I’m afraid to say that it needs to be governed, but come with a warning level, maybe," she says. 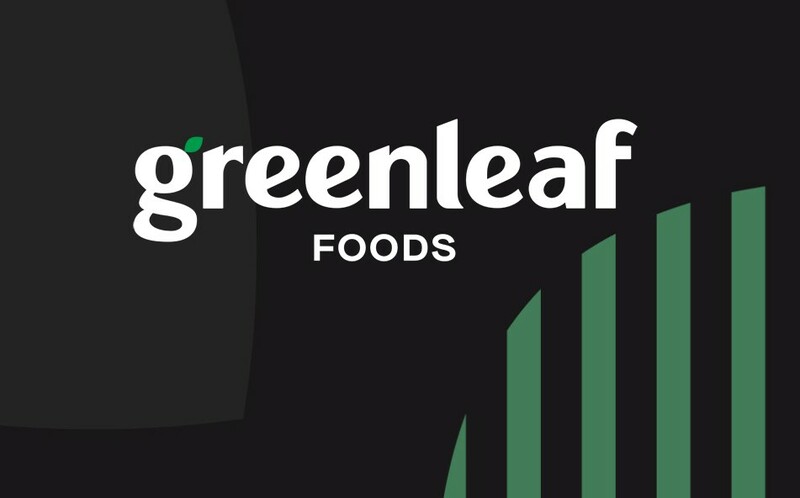 And, Seastrom supposes rules dictating what people can grow on their own property are unlikely to gain any traction in a more conservative state like Indiana. But his battle with bamboo may soon be coming to an end. "My wife has been bugging me to take the leap and eradicate this patch," he says. "So, that’s probably next on the agenda." Just how much work that will take is something he tries not to think about.